Design, handcrafting, and working with difficult materials constitute the values around which each OMAS pen is developed. 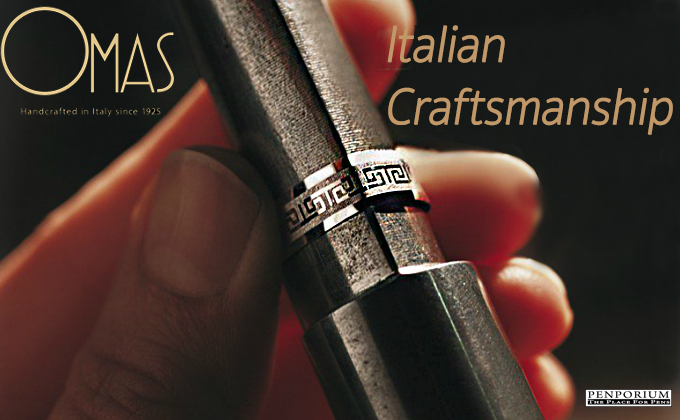 OMAS pens, handcrafted in Bologna’s workshop, have always been characterised by their timeless, elegant, essential design, devised and created by OMAS entirely in Bologna’ workshop bringing out the best of the typical characteristics of Italian creativity. Since 1925 handcrafted in Bologna workshop, an OMAS fountain pen is the result of a multitude of delicate operations that contributes to the creation of a unique and unrepeatable product. It can take up to 365 days to produce the exceptional lightness, refined brilliance, and surprisingly pleasant feel of a celluloid pen. Each OMAS writing instrument is produced with natural materials as cotton resin, celluloid, wood, titanium, gold and silver. These materials are very rare and difficult to work with but they can guarantee unique and exclusive products and an amazing pleasure of writing. OMAS pen is a genuine jewel of the highest level of craftsmanship, where creative and aesthetic abilities integrate naturally with technical and functional innovation. Each writing instrument thus becomes a unique and unrepeatable work of art, symbol of “Made in Italy” style.